The Canadian Association of Petroleum Producers publishes extensive statistics on the Alberta oilpatch, allowing us to use the industry’s own data to evaluate its health and whether or not the string of royalty cuts announced by the Government of Alberta since 2008 were justified. These statistics allow us to estimate the industry’s pre-tax profit, the government’s share of revenue and resource rent, and the portion of industry profit in excess of a normal rate of profit. The conventional oil and gas sector (Part 1) is considered separately from the tar sands (Part 2). The scale of wealth produced by Alberta’s oil and natural gas is immense. In the decade before higher royalties were to come into effect in January 2009, the value of this province’s conventional oil and natural gas production (excluding the tar sands) exceeded $525 billion. In addition to paying almost $93 billion in royalties and nearly $11 billion in land sales to the province for exploration rights, industry spent $273 billion on exploration, development and operating costs. That left oil and natural gas companies operating in Alberta with more than $148 billion in pre-tax profit. Under successive Progressive Conservative governments between 1999-2008, industry was granted more excess profit ($121 billion) than was collected in royalties and land sales ($104 billion). Alberta’s Department of Energy simultaneously maintains two targets for how much of the value of our oil and natural gas the government aims to capture with royalties and land sales. One is based on a share of industry revenue, the other on a share of resource ‘rent.’ Its share of revenue has been lowered over the years to 20-25 per cent, a share it has managed to capture only once since 2001. In 2007 and 2008, the province’s share of revenue was $2.5 billion below the bottom of the target range. Combining those two years alone, the government’s failure to reach its own share of revenue target exceeds the province’s 2010 deficit of $4.7 billion. If Alberta Energy did manage the upper range of its targets, oil and natural gas companies would still have been left with $56 billion in excess pre-tax profits over the last decade. 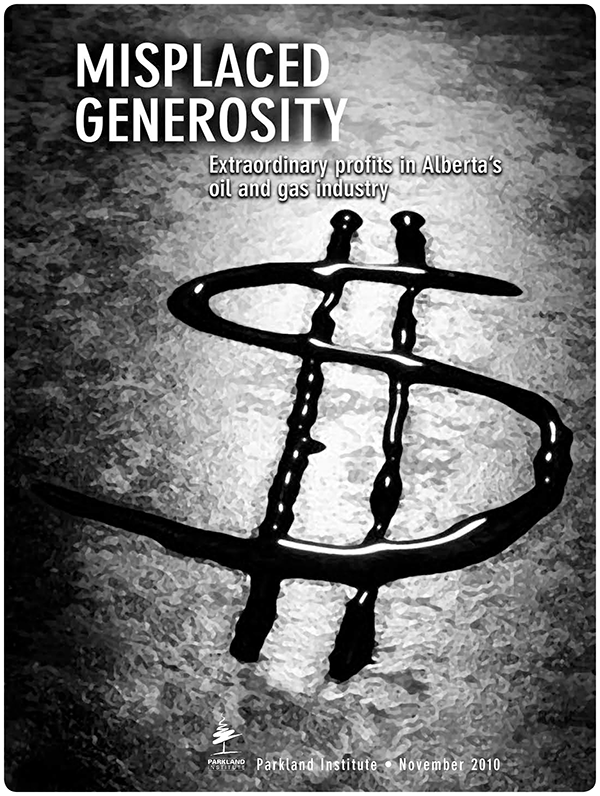 While the battle surrounding the Alberta Royalty Review was raging in 2007, the industry’s excess profits more than doubled from 2006 to more than $13 billion. In 2008, when the industry was moaning about the new royalty regime’s increased take of $1.4 billion sometime in the future, its excess profits almost doubled again, to nearly $23 billion. In all, between 1999 and 2008, Alberta’s traditional oil and natural gas industry enjoyed more than $121 billion in excess, unearned pre-tax profits-more than a quarter of which accrued in 2007 and 2008. The sun is slowly setting on Alberta’s conventional oil and gas sector. The vast majority of our province’s oil and gas has already been produced. More than 90 per cent of the province’s commercially viable oil and almost 80 per cent of its natural gas is gone. Most of what remains will be more expensive to produce and involve higher environmental risks and costs. With little left to show for the enormous amount of oil and gas produced under their watch, the Progressive Conservatives have hitched their wagon to what’s left: nearly 200 billion barrels of commercially recoverable bitumen oil in the tar sands. But for all the ink spilled over the tar sands, three important issues remain almost completely unappreciated: (1) a great deal of the research that has made production possible (and wildly profitable) in Alberta’s tar sands was publicly funded; (2) before the royalty changes announced in 2007, the industry had essentially written its own royalty regime (the main thrust of which remains in place, despite the tinkering); and (3) almost all costs are reimbursed with free oil. These insights provide crucial context for examining the scale of tar sands profits. Since more than a billion dollars of government-funded research unlocked 80 per cent of the tar sands and new industry-written royalties were implemented in 1997, Alberta’s tar sands have produced an increasingly enormous amount of wealth, but relatively little in the way of royalties for the owners of the resource. Since the 1997 royalty changes, Alberta’s tar sands have produced between $97 billion and $167 billion in pre-tax profits for the largely foreign-owned companies operating there. And, because of the cost structure in the tar sands, approximately 80-90 per cent of those have been excess profits. Despite the government’s targets of 20-25 per cent of revenue and 50-75 per cent of rent, its share of revenue has averaged only 8.1 per cent since 1997, its average share of rent ranging between 8.9 and 14.6 per cent. In all, companies operating in Alberta’s tar sands since 1997 have exchanged $19.3 billion in royalties/land sales for $205.5-billion worth of Alberta’s natural wealth-small wonder they have been tripping over themselves to get in on the action. But tar sands development has very serious environmental and climate consequences, and Albertans need to ask themselves whether receiving such limited revenue from this unbridled ‘gold rush’ model of tar sands development is the most desirable way to manage their natural wealth. To suggest there might be room for rebalancing royalties in the public’s favour is a profound understatement. There is obviously room for Alberta to collect much more in royalties, but that would also require a dramatic rebalancing of political power in Alberta. While the Parkland Institute does not advocate the provincial government continuing its unsustainable reliance on resource revenue for annual budget support, the vast scale of the excess profit granted to industry under Progressive Conservative management of Alberta’s natural resources suggests a sustainable alternative. Even if we limit ourselves to a portion of the excess profits granted to Alberta’s oilpatch under Progressive Conservative management, it is not difficult to imagine a much larger Alberta Heritage Savings Trust Fund generating upwards of $10 billion in sustainable budget support annually. With the sun slowly setting on the province’s conventional oil and natural gas and Albertans’ share of the wealth being generated by the tar sands being far more inequitable, the window of opportunity for such initiatives is closing. Photo credit: Pembina Institute under a Creative Commons licence.